This upcoming weekend, January 13th & 14th, 2018, the 31st Annual Boca Fest will be held at The Town Center Mall, one of South Florida’s top luxury shopping destinations and one of Boca Raton’s main attractions. This highly-anticipated outdoor community art festival will highlight the talents of nearly 200 exhibitors displaying a wide range of creative works in a variety of artistic mediums. From sculpture, painting, and glass, to ceramics, jewelry, and woodworking this phenomenal art festival will offer an abundance of opportunities to admire and purchase the artistic creations of some of the nation’s top artisans. The Town Center Mall is located just off of I-95 and Glades Road in the heart of Boca Raton. The show will take place from 10 am- 5 pm both days and will be located in the parking lot of The Terrace, a recent expansion of the outdoor space near Bloomingdales and The Blue Martini. Admission to Boca Fest is free with plenty of parking available, including valet. With a diverse mix of fine art, this visually inspiring event brings together an affluent crowd of national & local artists and those with an exceptional eye & appreciation for all things artistic. 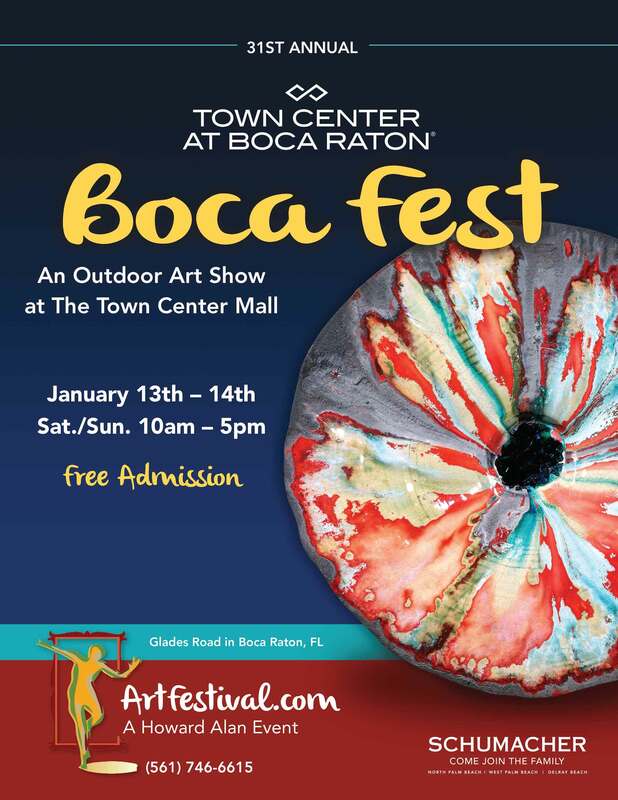 Don’t miss out on this annual community event and be sure to include Boca Fest in your plans for this upcoming weekend! Visit the Boca Fest event website for additional event information including the full list of exhibitors and festival hotel rates.